Why use Eco Laundry Detergent? Your might be surprised to learn that harsh chemicals are commonly used as additives in laundry cleaning products. For people with sensitive skin, especially eczema and psoriasis, then conventional laundry products can often prove irritating to their skin. Switching to an eco laundry detegent can often bring welcome relief. The award winning Ecover Laundry Liquid is hugely popular at So Organic and has been for many years. So gentle on the skin, yet the Ecover Laundry Liquid has great cleaning power as well! Whatever a products eco-credentials, as our philosophy says, if we would recommend it to a friend we will recommend it to you. If not, we won’t! 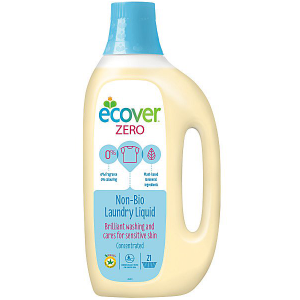 The Ecover Zero laundry liquid is the one our own founder uses and she finds it help her eczema prone skin enormously.